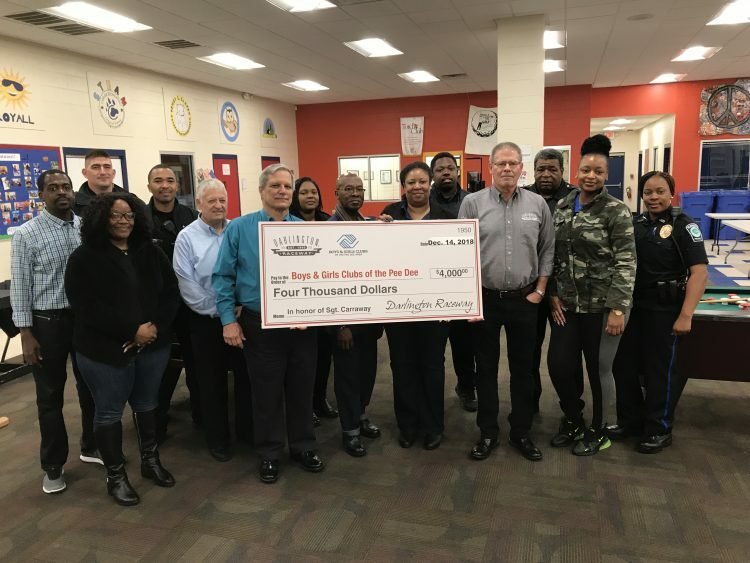 In honoring its continued commitment to the local community, Darlington Raceway was pleased to make a $4,000 donation to the Boys and Girls Clubs of the Pee Dee on Friday, Dec. 14, on behalf of Sgt. Terrence Carraway. Track president Kerry Tharp participated in a check donation ceremony on Friday at the club, along with Boys and Girls Clubs of the Pee Dee executive director Neal Zimmerman and Mrs. Allison Carraway, wife of Sgt. Carraway. Members of the Carraway family, Florence Police Department and Boys and Girls Club were also in attendance. Sgt. Carraway, a lifelong resident of Darlington and 30-year veteran of the neighboring Florence Police Department, was killed in the line of duty on October 3, 2018. He was a dedicated servant to the Darlington and Florence communities having been involved in a variety of community activities that benefited many residents, including children and teenagers. The proceeds for the donation were made possible by strong support for the Darlington Raceway 5K Presented by Academy Sports + Outdoors, which took place on Nov. 9 at the track under the lights. Hundreds of runners turned out for the event with a portion of the proceeds benefiting the Boys and Girls Clubs of the Pee Dee, an organization Sgt. Carraway was heavily involved in for many years. Darlington Raceway will look to continue the 5K event on an annual basis in support of law enforcement. Sgt. Carraway was one of seven total law enforcement officers from the Florence County Sheriff’s Office and Florence Police Department that were shot in an incident in Florence on Oct. 3. Florence County Sheriff’s Deputy Farrah Turner also passed away from her injuries on Oct. 22, nearly three weeks after the incident. The other five officers are continuing to recover.